There was a statistically significant difference in ADC measurements between the patients who had necrosis and those who did not (p<0. Despite good treatment response in our patient, we decided to perform prophylactic laser photocoagulation on the area of necrosis and atrophic retinal focus in the superotemporal quadrant in order to reduce the likelihood of rhegmatogenous detachment. It is well proven that in avascular necrosis of femoral head, early diagnosis and treatment is the only way to halt disease progression and avoid the disastrous collapse and secondary osteo-arthritis of femoral head. 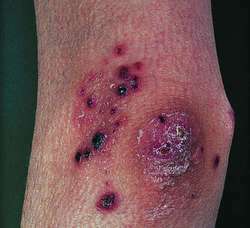 6%) were mainly present in cases of necrosis without epithelioid granulomas; p<0. Autologous skin transplantation for widespread cutaneous necrosis in secondary antiphospholipid syndrome. To investigate whether the observed necrosis in CHX-and oxLDL-treated [Casp3. Fat necrosis of the breast: Clinical, mammographic and sonographic features. However, when drainage was deemed insufficient, we subsequently performed endoscopic debridement to remove the infected necrosis. Both membranous and lipophagic fat necrosis may be seen, sometimes with pseudocyst formation. Final gross and histologic diagnosis was granulomatous fat necrosis causing extraluminal obstruction of the colon. We would like to thank Sanal (1) for her interest to our paper "Avascular Necrosis of the Femoral Head in a Patient with Behcet's Disease" (2) and for her nice contributions to the topic.